WASHINGTON -- Donald Trump, the winner in two of the first three states in the presidential primary season, has long been laying the groundwork for more victories in March, when two dozen states go to the polls, new campaign finance reports show. Hillary Clinton's Nevada victory -- what's different from 2008? In January, his campaign had roughly 100 people on its payroll and field consultants and offices from Alabama to Texas, giving him a head start on connecting with voters as the primary calendar intensifies. 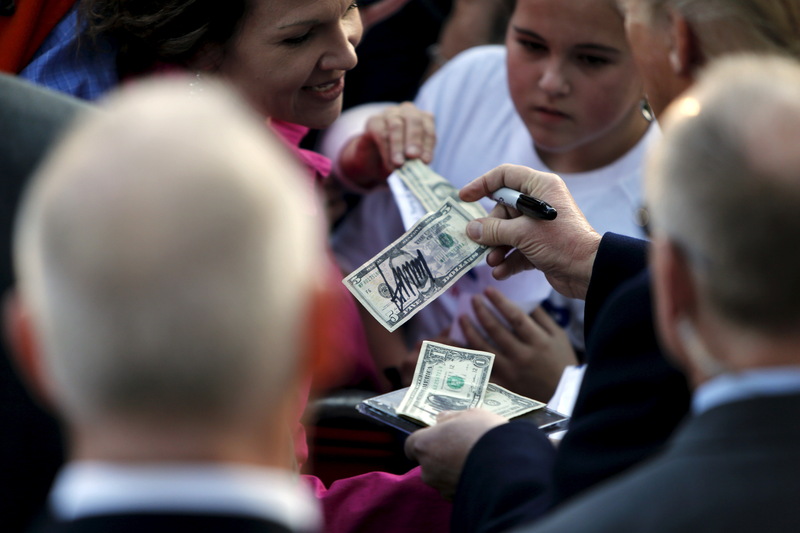 He has so far invested about $17.5 million into his bid, a fraction of what most of the other candidates have spent. But Trump has been able to pump money into employees and offices in part because he saves cash in important ways: He doesn't do traditional fundraising, which can be pricey, and has done far less advertising than is typical for a leading presidential candidate. The robustness of Trump's field operation as outlined in the January fundraising reports looks more like that of Democrats Bernie Sanders and Hillary Clinton than any of his four Republican competitors. The new report shows he increased his spending in January to $11.5 million. At the beginning of the year, Trump had more salaried campaign employees than Texas Sen. Ted Cruz or Florida Sen. Marco Rubio, whom he has identified as his two closest competitors. In addition, Trump had at least 17 paid field consultants in states beyond the first four to vote, a network that touched Alabama, North Carolina, Ohio and Virginia. And his campaign was already paying for office space in eight states that vote in March. Sanders and Clinton each had a presence in at least a dozen states voting in March, their January campaign finance reports showed. These fundraising reports filed Saturday with the Federal Election Commission show Sanders significantly outspent and raised more than Clinton in January, but he had half the amount of cash on hand as she did. Other Republicans -- perhaps focused on notching a win in one of the four February voting states -- didn't appear to be thinking much about March back in January, that month's financial reports show. Ohio Gov. John Kasich had two offices in March states (including one in his home state), Rubio one and Cruz none, though his campaign headquarters is in Houston, where voters weigh in March 1. His campaign declined to tell reporters on Saturday how much they've raised in February. Rubio's campaign said it will open a Georgia office on Monday, and earlier hung its shingle in Birmingham, Alabama, and Maple Grove, Minnesota. Rubio's campaign -- which appeared to have no March state field staff in January -- is now redeploying people from Iowa and New Hampshire. Among the recent hires is Chip Englander, who had been Rand Paul's presidential campaign manager. Based in Ohio, he'll oversee Rubio's efforts in the Midwest. Cruz's campaign showed payments to a handful of strategists in March-voting states, including Michigan. The campaign finance reports show Kasich and Rubio had little cash to work with in January: They started the month with $1.5 million and $5 million, respectively. Both insist they can pick up new donations after former Florida Gov. Jeb Bush ended his presidential bid on Saturday. Cruz had $13.6 million at the beginning of February. With so many states on the cusp of voting, presidential campaigns typically rely on television commercials as a way to spread their message far and wide. Trump put about $10 million into his advertising plan for the first four states. That's less than the $17 million Rubio's campaign has put into television and radio ads, advertising tracker Kantar Media's CMAG shows. Cruz is spending a bit less than Trump on TV, but has counted on outside groups to chip in for him with favorable commercials. Here again, Trump may have an edge: He has sworn off big-money help -- from anyone other than himself. That means he can continue his pay-as-you-go campaign finance strategy while the other candidates either must spend time fundraising for their campaigns, or hope a wealthy donor decides to give big to an outside money group that will lend a hand.